First Presbyterian Church has fostered community gardens since the nineteenth century. Its now-former pastor nearly put an end to that. For D’onminique Boyd, it was the 65th Street Community Garden that turned Woodlawn into a home. She had moved there in 2011, and had taken to biking around to familiarize herself with the neighborhood. One morning, she biked by the garden and saw Tony Samford, 65th Street’s “godfather of gardening,” as she would later come to call him, tending to his plot. She asked what he was growing; he told her to come back the next day at 6am, and he would teach her. “I was his sidekick that entire summer,” Boyd recalled. The next year, Boyd had her own plot, where she planted seedlings after failing to grow greens from seed. As she gained experience, she grew more, and more successfully. The next year she grew okra from seed, and four years later she started growing a variety of herbs for an alkaline diet. As Boyd was designing her curriculum in mid-March, however, a series of events unfurled that would take her and gardeners across the city by surprise. On March 17, the first days of planting season were just around the corner, but the pastor of the First Presbyterian Church—which owns the land on which the 65th Street Garden and its sister garden Kumunda sit—sent out a letter that the two gardens would be shutting down, effective immediately. Shortly thereafter, the gates to the gardens were padlocked shut. And the gardens weren’t the only thing that had been shut down: the church’s website and Facebook page were down, and the phone line had been either removed or disconnected. After the leadership committee’s month-long media campaign—with coverage in the Tribune, the Sun-Times, and WBEZ, among others—the Presbytery of Chicago, a regional administrative board composed of ministers and clergy members, interceded in the impasse between First Presbyterian and the gardens. First, the Presbytery fired Amariah—not for shutting down the gardens, but for not providing valid proof of ordination when she was hired in January 2017. Then, they dissolved First Presbyterian’s session, the local board of elders responsible for hiring pastors. A week and a half later, the Presbytery finalized a contract with the gardeners that would extend the life of the gardens by at least one more year. While the reopening of the gardens comes as a relief to many, the unusual sequence of events that unfurled around the closing—and reopening—of First Presbyterian’s two community gardens under Amariah’s tenure has invited conflicting accounts of how the gardens, and the church, have grown in Woodlawn. After weeks of silence, Amariah spoke out to the Sun-Times last week, telling columnist Mary Mitchell that she never intended to close the gardens, only to replace the current leadership, which, she alleged, was failing to service neighborhood residents. The church required that the garden be composed of at least fifty percent Woodlawn residents, Amariah said, and the garden had failed to do so. Longtime gardener Brian Wildeman, among others, refutes these claims. “On our own accord, we have always given first priority to Woodlawn residents and we will continue to do so,” Wildeman added. Gardeners were not the only ones taken aback by the series of events. In the Presbyterian church—a denomination defined by a commitment to democratic decision-making—and in a congregation defined by a history of activism and gardening since the early days of Chicago, the garden closures seemed to signal a break from First Presbyterian’s mission to provide food access and education. As the gardens reopen and the dust settles, however, questions remain about the future of the shrinking church and its relationship with the gardens—and what the now-former pastor hoped to gain by shutting the gardens down. Officially, the 65th Street Garden was founded in 2006, and Kumunda Garden in 2012. But the story of the two community gardens really begins three decades earlier, and several blocks northeast. In 1986, that is, when 61st and Blackstone was home to the independent recycling company Resource Center. With the Resource Center’s permission, the parcel also became home to a small garden, an experiment in intensive corn cultivation spearheaded by Hyde Park resident Mike Fowler. But then Fowler planted a vegetable garden and some fruit trees to the west, and before long, a dozen other gardeners from Woodlawn and Hyde Park alike had joined him. By 1995, gardeners Dan Peterman and Connie Spreen had purchased the land, maintaining the garden and using the existing building to house small businesses, educational programs, and a woodshop. The cultural hub and incubator “61st Street,” as it was known then, has since grown into the Experimental Station, which now houses journalism and accountability group Invisible Institute, community journalism nonprofit City Bureau, Blackstone Bicycle Works, the 61st Street Farmers Market, and the offices of the Weekly. A series of forced displacements followed over the next fifteen years. The first came in 1998, when the city used its powers of eminent domain to build an additional wing for next-door Carnegie Elementary school on top of the garden. 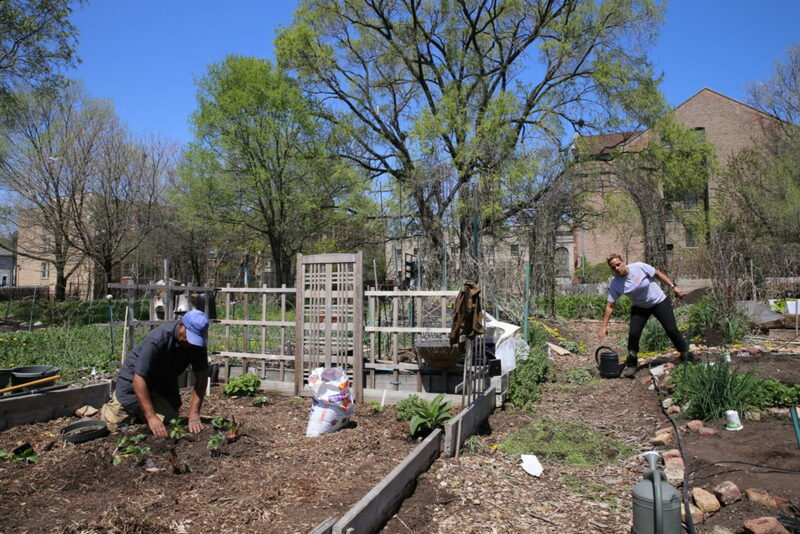 The garden shifted southward temporarily, and then moved again the next year on an invitation from the University of Chicago to a university-owned parcel on 61st and Dorchester. The last move would come in 2009, when the UofC decided to reclaim the garden space, which by then housed 143 plots tended by 130 households, for use as a staging area for a new seminary building. The announcement spurred an organizing battle of giant proportions, spanning local and national media outlets, as gardeners made a moral argument for why the garden should be incorporated into the university’s plans, rather than paved over. Experimental Station staff and gardeners argued that even though the gardens had a strong presence of Hyde Park gardeners, the garden did more than just provide access to land for Hyde Parkers: it created a “little ecology,” as Experimental Station co-founder Spreen termed it in an interview with the Center for Humans & Nature, out of which grew a robust social network and a food network that helped to combat a lack of access to fresh produce in Woodlawn. Spreen started a farmers market at the Experimental Station in 2008, and in 2010 worked with the city to permit food aid recipients to purchase farmers market produce with LINK cards. In spite of their organizing and documentation of the garden’s community importance, the UofC wouldn’t compromise, and in 2009 the gardeners were forced to disperse for good. Some set up shop at a new location allocated by the university on 62nd and Dorchester, which remains there today. But at the time the garden was small, with a little over half the capacity of the prior space. And so gardeners ventured further south, to a young but flourishing community garden led by Woodlawn residents on land owned by First Presbyterian at 65th and Woodlawn. To accommodate the expansions, the university provided around twenty thousand dollars’ worth of soil to 65th Street, as well as to the new garden on 62nd and Dorchester. Following the influx of gardeners from 61st Street, Wildeman said, the 65th Street garden grew to be so large that in 2012, then-pastor Reggie Weaver turned to the garden committee and asked them to create the infrastructure for another. So the community members did, across the street from the church, at 6435 S. Kimbark Ave. One of the early gardeners, Benja Murphy, suggested they name it Kumunda, a Shona word meaning “in or at the garden,” which his Zimbabwean mother-in-law would use to describe the 65th Street garden. “Kumunda wouldn’t exist if the church hadn’t asked us for it,” Wildeman said. Every year, the garden committee would sign a contract with First Presbyterian. The contract allowed the gardeners to use First Presbyterian’s land, so long as they were financially independent and made sure the land looked presentable. As thanks, and as part of their commitment to the neighborhood, gardeners from 65th Street and from Hyde Park synagogue KAM Isaiah Israel would glean produce throughout the year to donate to the church’s decades-old food pantry. Garden coordinator Liz Gardner estimated that they’d donated between 1.5 and two tons of produce to the pantry since the program’s inception. Over the years, the gardeners settled into a funding system that worked well for everyone: each plot would cost forty-five dollars per year (though a sliding scale was available for those who couldn’t pay that amount), which would cover the price of insurance, communal tools, and miscellaneous expenditures. Many gardeners retained their plots from year to year, but when a new one opened up, according to Gardner, Woodlawn residents would have first priority. Until this past fall, there was no reason to think that the relationship between the church and the gardens was in jeopardy. In past years, pastors such as Reggie Weaver, who had been an enthusiastic gardener, maintained their own plots. But problems began to arise last year when Amariah inquired about getting her own plot, said a garden representative (who, along with others who spoke to the Weekly about tensions between the garden and the pastor, was granted anonymity for fear of recrimination). When the garden leadership told her that there were no plots open in the 65th Street Garden, only in Kumunda, Amariah was upset, said the source. She also allegedly tried to get the garden leadership to waive the plot fee, given her role as pastor, but the garden committee declined to do so since previous pastors had not been exempt. On top of this, word of several small disagreements within the garden—about a gardener who was “poaching” produce from other garden beds, upsetting two gardeners who then left the garden; and about gardeners letting their plots go to weeds, causing seed to disseminate into other nearby garden plots—made its way to Amariah, say two sources. By the time Amariah confronted the garden committee last fall, however, the issue had taken on a decidedly racial tone: she expressed concern that the two gardens were segregated along racial lines, with the more built-out 65th Street Community Garden servicing white gardeners, while the newer, less developed Kumunda serviced Black gardeners—a claim that many gardeners of both races reject. According to Wildeman, the garden steering committee’s rebuttal was that her understanding of the racial divide between the two gardens was a misperception, and that the racial makeup of both gardens had remained constant at sixty percent Black gardeners and forty percent white, which is whiter than the makeup of Woodlawn but consistent with the garden’s history. In the Sun-Times article, Amariah accused the gardens of skewing too far toward non-Woodlawn residents in composition, making the same accusation in different terms. A garden representative sympathized with why this would appear to be the case, saying that Amariah was much newer to the church than many within the garden community, and may not have understood that the demographics of the garden were more nuanced than they appeared. For example, the representative said, many Woodlawn residents who have moved away still maintain garden plots. In the interest of minimizing the discrepancy of resources between the two gardens, and resolving the conflict that had pulled church leadership in, the steering committee offered to make improvements to Kumunda several months before the controversy erupted into public view. They offered to put in a backgate, so that they could keep more supplies and equipment in the shed. The church would not sign off on it, said the representative. Now, in the new contract with the Presbytery, the garden committee has committed to building out Kumunda so that gardeners have similar amenities: per the contract, gardeners will build a more substantial fence around Kumunda and will install portable toilets in both. 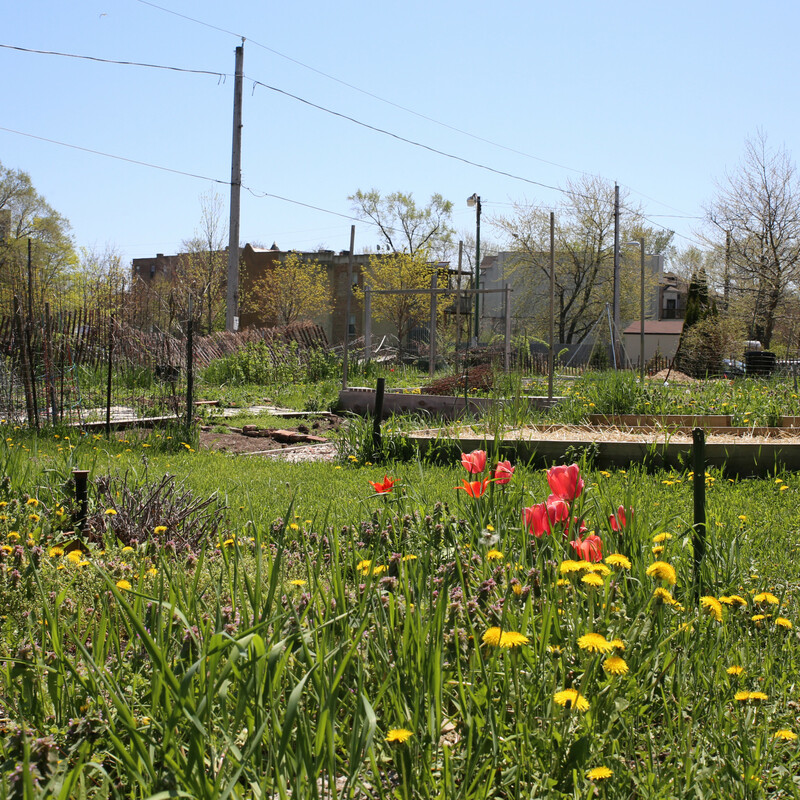 Both gardens will be fiscally managed by NeighborSpace, a nonprofit that works to secure community gardens across Chicago, the Tribune reported last week. The important thing to understand about First Presbyterian, Dianne Luhmann told me, is that for most of the church’s existence in Woodlawn, its members have organized themselves around food alongside Woodlawn residents. A member of First Presbyterian since 1967, Luhmann is now the church’s archivist and is currently working on building a collection of First Presbyterian archives at the Newberry Library. We sat in her Hyde Park living room among empty boxes and filing accordions to talk about the church’s long history of social justice, and of gardening. In 1976, Luhmann and several other church members started a garden called God’s Little Acre on several vacant lots directly south of the church building. The garden encompassed twenty-five plots, shared between around thirty families, some church members, some not. The garden, as it existed on that land, was short-lived: in its first two years, gardeners had spread sewage sludge—which the then-Metropolitan Sanitary District was marketing as “Nu-Earth” and distributing to gardeners around the city for free—across its garden beds. In 1979, the soil was tested and found to contain more than forty parts per million of cadmium, a heavy metal and industrial waste product. The U.S. Environmental Protection Agency (EPA) considers two and a half parts per million of cadmium in a vegetable garden to be cause for concern; the metal, if ingested, can cause considerable kidney damage. It was a city-wide scandal, affecting up to 50,000 Chicago gardeners, and leading to a lawsuit against the Sanitary District for its failure to roll back its distribution of Nu-Earth when it learned, in 1977, that the sludge contained higher levels of cadmium than was safe for use in gardens. For the congregation at First Presbyterian, it was deeply upsetting. But it was also a galvanizing moment: the controversy and the church’s rhetoric around food justice would be the first step in a decades-long period of deep involvement with food access and urban agriculture initiatives. In July of 1979, God’s Little Acre was plowed under as then-pastor Art Smith, his congregation, and gardeners looked on. (A note from an EPA scientist reads, “The closing of this garden is good—until garden can be conditioned. Very sorry about this.”) Shortly thereafter, Smith contacted the Center for Neighborhood Technology (CNT), a nonprofit that coordinates with community groups to implement sustainable technology, for help in constructing a greenhouse on their property. The church had the contaminated soil cleared from their property and replaced, and in 1981 a construction crew broke ground on the same parcel of land. Ten weeks later, a greenhouse stood, attached to the southernmost wall of the 1928 church building. Underlying much of the correspondence between church leadership and other organizations is a sense of precarity. First Presbyterian received substantial funding from sources as diverse as the CNT, Retirement Research Foundation, the Mayor’s Office for Senior Citizens; the Minneapolis-based Control Data Corporation, the Presbytery’s national hunger committee, the Presbytery of Chicago, and church members themselves, as well as support from local and regional organizations. But First Presbyterian leaders were worried about long-term financing. The Silver Streakers started a new God’s Little Acre across the street from the church, where a building had been recently demolished. Their “idiosyncrasies” in gardening led to a garden that was “well-maintained,” colorful, home to “a barbecue area and…a good sense of community,” according to remarks Chicago Botanic Garden official Becky Severson made when she awarded God’s Little Acre the “Best Overall Community Garden” in Chicago Horticultural Society’s annual contest in 1988. 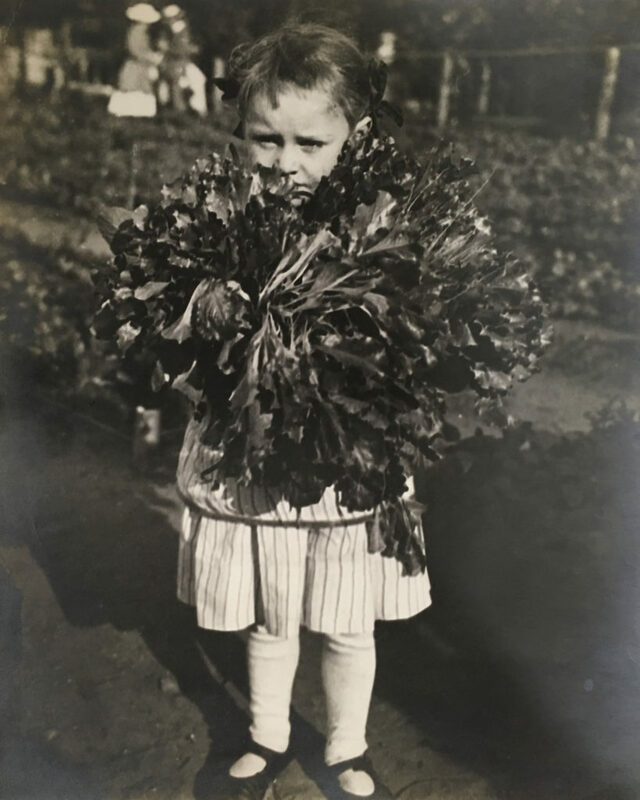 As Luhmann began archiving the hundreds of boxes of documents and photos in First Presbyterian’s Woodlawn churches, she came across an undated paper listing the harvest from a church garden. As she would later learn, the document came from the Railroad Mission, a First Presbyterian mission founded in 1857, started up in two railroad cars of the Michigan and Lakefront Southern Railroad. The mission, which eventually grew into a social settlement program, moved southward over the decades, from Griswold and Van Buren, to its own chapel on 14th and State, then 38th and Dearborn, and finally to 37th and Vincennes. The records from the time are spotty: where there should be documents there are instead notes that read, “I’ll return this later,” Luhmann said, making light of an institutional disregard for record-keeping that clearly irks her deeply. But from what she’s learned, integrated gardening classes and Sunday School seem to have been a central part of the mission’s programming for kids. Such programming would have been in alignment with the congregation’s progressive values, which included dedication to abolition, in the earlier days, and a dedication to remaining an integrated congregation later on. But the Railroad Mission also seems to have been an incidental outgrowth of the church’s relationship with its wealthier members. Many of the church’s early members had investments in railroad companies. But there were all these “ruffians,” Luhmann said, hanging around on the railroad tracks, throwing rocks at train cars and disturbing the peace of mind of the church’s wealthier members. She suggests that the Railroad Mission’s gardens and the Sunday School were an appealing way for the church to keep kids out of trouble and the wealthier members’ property interests out of harm’s way. And indeed, the Railroad Mission’s first chapel was located on Griswold, south of Van Buren, on land gifted to First Presbyterian by the Railroad Company. The symbiotic relationship between the church and the entrepreneurial class of early Chicago would inform the way in which the church moved, and the way its congregation changed as it moved. As the church moved southward into the Black Belt, from Wabash and Congress, to 21st and Indiana in 1912, and then to 41st and King (then known as Grand Boulevard) in 1918, the wealthier members and their families would move further north, and drive in for services. And because the church continually merged with existing congregations, by the mid-nineteenth century the dynamic of commuting, wealthy members, and local middle-to-lower-class members became a defining feature of the congregation. Wealthier members would help to fund the church, allowing it to step more purposefully into community engagement in the increasingly poor, underserved, and Black neighborhoods it found itself in. But the flipside to this was that much of the church’s programming depending on the presence and continued support of sponsors and donors. For a long time, Luhmann was bothered by the lack of documentation around the Railroad Mission’s shuttering in 1918, after more than fifty years of programming. But after a deep dive into the social pages of the Tribune, she came across a death notice for a shoe magnate and First Presbyterian member. There is something melancholy in the way that the Luhmann speaks about the closure of the Railroad Mission, perhaps due to the fact that the church’s congregation has, in a sense, been watching history repeat itself. By the early 2000s, the grand vision of a Woodlawn food hub situated around First Presbyterian had begun to fade. At least, it was beginning to be recognized that if it was going to happen, it was going to happen on the church’s land, but not on their initiative. The second God’s Little Acre remained active across the street from the church, under the watchful eye of a senior resident named Sterling, and the church retained its hot meals program. But its Headstart program, along with its educational garden, had folded in 2007 because of decreasing enrollment and decreasing federal funding for the program. And Luhmann said that there just weren’t enough members capable of leading such programs. By this point, too, the greenhouse was desperately in need of repair. The fact of the matter was that the congregation of First Presbyterian, which had once reached a peak of several thousand, was dwindling, and those that remained were aging. In the mid-1980s, the congregation stood at a healthy 400 members. As of 2016, according to Presbytery of Chicago records, the congregation was around forty-six, making the oldest Presbyterian church in Chicago now, also, one of the smallest. And the congregation had become mostly local: over the years, commuting members passed away, and their children, lacking a connection to the church, turned elsewhere. But the church still had land—between ten and sixteen lots of vacant land from Dorchester to Greenwood, depending on the year—and would invite external organizations to use it. In 2003, U-FIT, a short-lived local Growing Power program, came in with an ambitious proposal for a Community Food Center that would provide food, along with agricultural education and community-building. They built out a farm around God’s Little Acre and operated it for a year, with plans to start a farmstand and training programs for Woodlawn kids. But the program folded in early 2004 for internal reasons, and the farm went fallow. 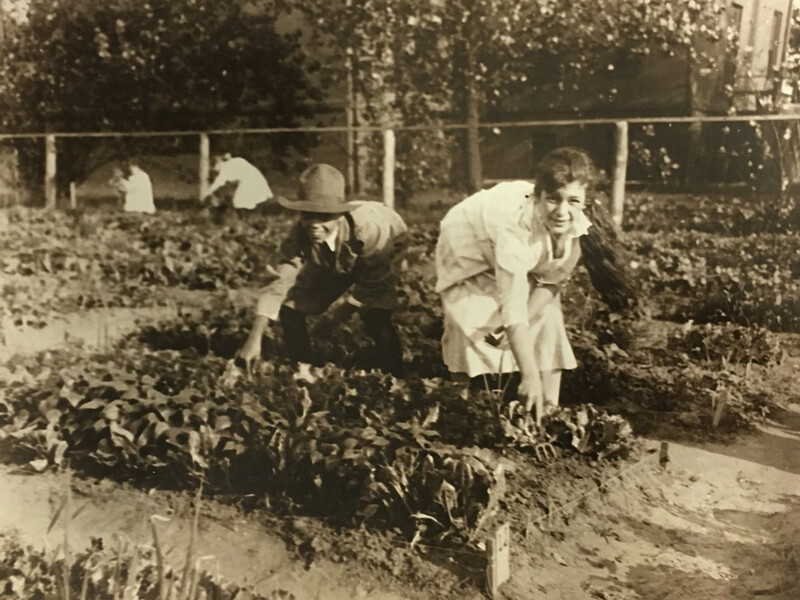 Then, several younger Woodlawn residents started gardening at God’s Little Acre, as Sterling, the senior who had overseen them, got older and was increasingly unable to tend to the gardens. In 2006, because of concerns about Sterling’s use of chemical fertilizers at God’s Little Acre, they started cultivating plots at the location that would become 65th Street Community Garden. In 2008 they signed a contract with First Presbyterian, formalizing the relationship between the garden and the church; in 2010 they expanded to the full two parcels of land. For the second time, God’s Little Acre had gone fallow; and at the same time a separate institution was born at 65th Street and Woodlawn. Questions remain about what happened under Amariah’s tenure as pastor—not just with the closing of the gardens, but her closing of the church’s daycare program and her decision to charge rent to the Shrine of Christ the King parishioners who had been using their gymnasium for services since 2015, when their own church to the east burned down. Stanley Smith is one of several members from Fourth Presbyterian—a church on the Magnificent Mile with a much larger congregation and a similar commitment to community gardening—who gardens at the 65th Street garden. For the last decade, Smith and other Fourth members have come down to First Presbyterian every spring to help the small congregation keep up with its sprawling campus by weeding, trimming, planting, and spreading mulch. But he also said that what happened when she closed the gardens was a violation of the church’s mission. And it may be that First Presbyterian, which, in the last two weeks, has seen its pastor fired and its session dissolved, no longer sees a future for this mission. Though First Presbyterian is still one of the parties listed in the contract with the gardeners, it was the Presbytery that negotiated on behalf of the congregation. The Presbytery is seeking an interim pastor to fill the empty position at First Presbyterian, Chicago’s executive presbyter Rev. Sue Krummel told the Weekly, and they are adjoining an administrative commission to work through what happened when the pastor was hired. Most of the people the Weekly spoke with were not sure what this meant for the church’s role in the gardens, let alone the church’s future. But the gardeners at 65th, and at Kumunda, aren’t dwelling on these questions. On a warm, sunny Saturday morning shortly after the gardens had reopened, D’onminique Boyd and a couple of other gardeners were out in the gardens. Boyd had brought seedlings along, bought cheaply at a West Side garden sale: cabbage, kale, leeks, and lettuce, for starters. As a weed cutter hummed in the background, Boyd talked about how she’s happy to be able to continue to learn and share her knowledge in the garden she’s spent six years cultivating. Emeline Posner is the Weekly’s food & land editor and a freelance writer. Her last Weekly piece was an obituary for Zaleski & Horvath MarketCafé. I really enjoyed learning from this article about the history of First Pres in Chicago and their long-standing forward-thinking support of gardening, food justice, and social justice. Despiye gardening at 65th& Woodlaen for over ten years now, I wasn’t aware of much of this history. I’m not a church-going guy, but what a cool church! Thanks Emeline! Thanks again for your thoughtful well-researched article! This was an article of exceptional depth and quality regarding these beautiful gardens, into which so many people have poured their energy over the years. It was illuminating to learn more of the church’s history, and the gardens’ as well. I’m grateful for everyone who helped defend them.